The furniture that's part of our entertaining and daily lives becomes part of a special story. The Amish Lindenhurst Sideboard makes an impressive presentation with rich wood defining its cabinets and drawers. Adding storage and a sightly display, this wood cabinet is a joy to use. 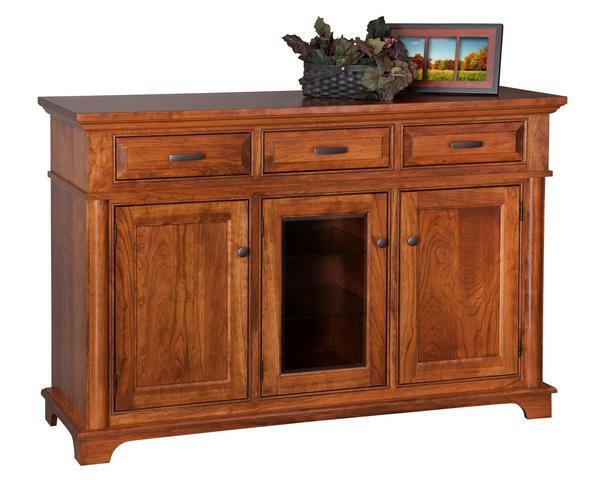 The Amish Lindenhurst Sideboard is shown here in sap cherry wood with seely finish. The LIndenhurst provides everything you need for serving and storing. Three drawers and three cabinets offer room for dishes and silverware, candles and platters, while the top is a lovely area for setting out a buffet or displaying family photos when you're not entertaining. Please email or call us--we'd love to provide you with top notch customer service to go with our beautiful furniture. The Lindenhurst Sideboard is solid wood furniture that will be part of your family history. We are happy to answer any questions about wood types, finish, shipping and more. Thank you for shopping with DutchCrafters. Shown in Sap Cherry with OCS Seely Finish.